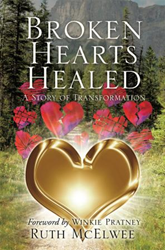 Ruth McElwee’s new book, Broken Hearts Healed - A Story of Transformation, ($16.49, paperback, 9781498453639; $26.49, hardcover, 9781498453646; $8.99, e-book, 9781498453653), is the inspiring true story of Ruth and her journey to redemption and romance. It encourages readers that through Jesus Christ, transformation conquers all, even the pain of childhood sexual abuse. At five years old, Ruth was an outgoing girl and her favorite place was church – until her world was rocked by sexual abuse. She lived in a private hell of silence, rejection, rage and shame. As a teenager, she spiraled further into depression, embracing a lifestyle of promiscuity, sensuality and self-hatred. Ruth longed for love, but did not believe that she would ever find it. She questioned, “Who would ever want to marry a fallen preacher’s daughter?” Her powerful testimonial will grip the hearts of many readers as they identify with shame, pain, anger, guilt, regret and self-acceptance. The author stresses that true romance and sexual purity are not impossible to experience no matter how far you have fallen. God’s amazing love can redeem and restore. Ruth McElwee holds a B.A. in English and two minors: Psychology, Counseling and Rehabilitation from Marshall University in West Virginia along with an A.A. in Biblical Studies and a Teaching Certificate from University of the Nations, Youth With A Mission. She served for seven years in YWAM. Ruth and her husband Ross helped pioneer YWAM Barbados and served at Tyler, Texas, YWAM. Ruth served for seven years in White Mountain, Alaska, helping Ross pastor the remote village of 200. Ruth is an Alaska representative for Advocacy for Victims of Abuse (AVA) and currently serves at Alaska Christian College in Soldotna, AK. Xulon Press, a division of Salem Media Group, is the world’s largest Christian self-publisher, with more than 15,000 titles published to date. Retailers may order Broken Hearts Healed - A Story of Transformation through Ingram Book Company and/or Spring Arbor Book Distributors. The book is available online through xulonpress.com/bookstore, amazon.com, and barnesandnoble.com.